Hello all! We have a good news to share with you guys! 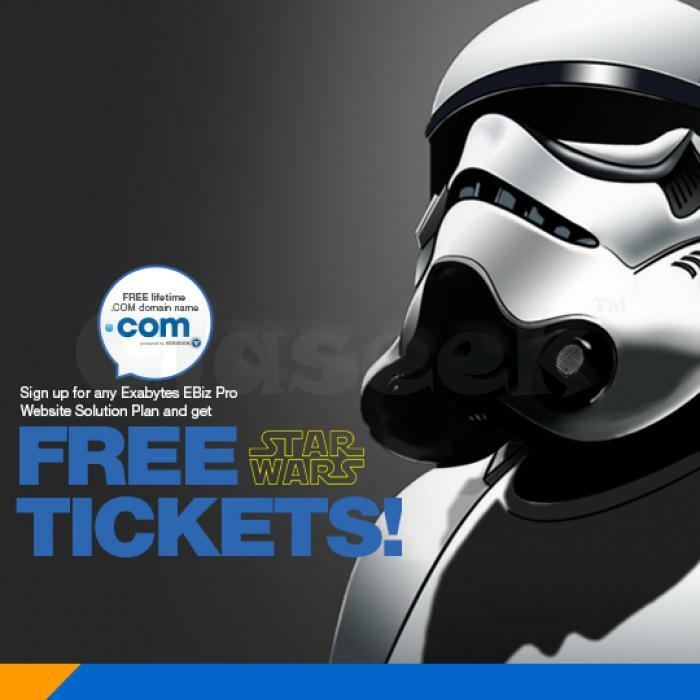 We are giving away 2 FREE Star Wars movie tickets! Check out how to GRAB NOW. First-come, first-served!! Step 1: Head on to http://goo.gl/SGE9eA and purchase any EBiz Pro plan Step 2: Fill out the reservation form at http://goo.gl/lTMoVW You are done! Easy right? Join the Force today, MAY THE FORCE BE WITH YOU! Act Quick, it’s now or never! **Remember to check out the T&C belowT&C Apply: 1) This movie ticket giveaway is valid from 20 Nov 2015 to 11 Dec 2015. 2) In order to claim your free movie tickets, you must make payment for EBiz Pro within the promotion period. 3) Free movie tickets come with free drink and popcorn4) Exabytes reserves the right to update, change and modify the terms and conditions, or terminate the promotion at any time without prior notice.